I have totally fallen for the Monogram trend. I just want to put my initials on everything! 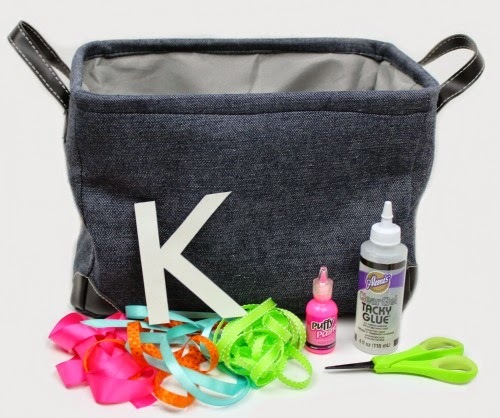 I made this supper cool Monogram storage tote for my friend using some Puffy Paint and her initial that I printed from my computer using word art. It was so easy! 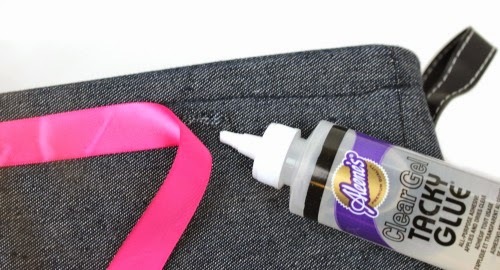 Step 1: Using the Clear Gell Tacky Glue, wrap ribbon around the bin near the top. 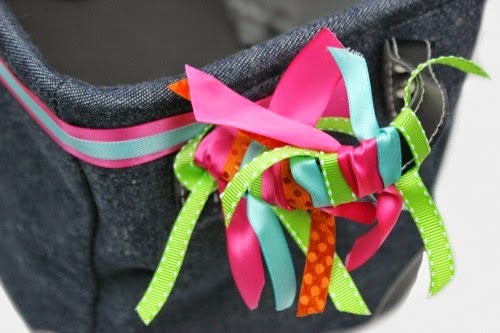 Layer 2 different ribbons for more visual appeal. Step 2: Place the cut out word art letter in the middle of the storage bin. If you are worried about it moving you can adhere it down with repositionable adhesive. 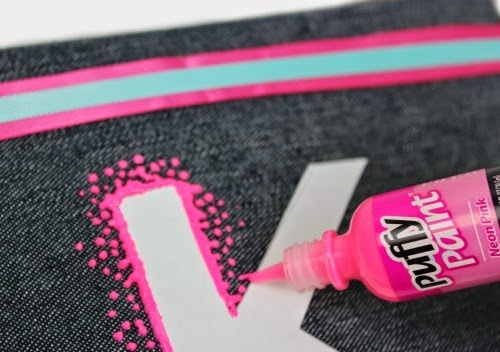 Take the puffy paint along the outside of the letter. Add more dots closer to the letter and less as you move outwards. Then remove the paper letter. Step 3: Cut the ribbons into about 6 inch strips and tie and tie them around the handles. You can add a few or cover the entire thing like I did. This adds such a fun twist! It was so easy to make, but the results are awesome! Personalization is everything these days! 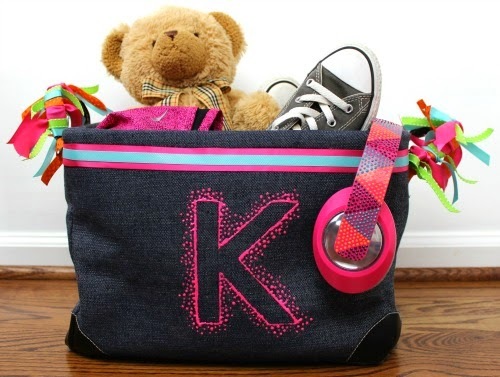 This would be such a cute basket for a gift too, that they can then use as storage in their room! It is perfect to store all of those random knick knacks in a stylish way! I am glad to see that people are actually writing about this issue in such a smart way, showing us all different sides to it. Thanks for sharing, please keep it up. Also checkout our new year 2017 Greetings new collections. I read blog thoroughly; it’s quite informative and well written post. You covered the topic very well. Thanks for sharing. Nice post.Great blog.Thanks for sharing. It was very interesting and meaningful. Excellent post and interesting topics i read and loved it already..
Gone are the days when a business laid down an annual sum to have its information listed in the Yellow Pages. These days it’s crucial for all businesses to instead prominently list themselves in online directories.AIR pros is a directory of service companies in your area with a geolocation system, automatic translation of the content.The site is optimized to facilitate the referencing of referenced companies.You can search for companies by department or city and look at their profile before contacting them. Essence advises and have a celebration that will come within the extended mileage of parties, and however Best Birthday Planners in Lahore not able to highlight how important it's to help keep things convenient, however, many importantly, reliable. You must know that people treat every child like our personal. Compare dozens of car rentals and hundreds of vehicles for rent. Reserve with Guide to Iceland for the best prices and most transparent car rentals in Iceland. See few of the testimonials that we have received.she made the whole bad flight experience disappear. The people that dealt with us were nothing but great. Perfect Movers values focus on the notion that each task we try must be given its utmost care and specialized solution as possible. Our facilities are assured within the finest professional-quality by understanding and evaluating the type within the Moving needs. Great blog with some wonderful articles. Glad to find your blog!